Stay fresh: Dry vines retain their colour and texture for years. Tired of reading meanings or concepts from plant material? Looking for an arrangement that is not just decorative either? 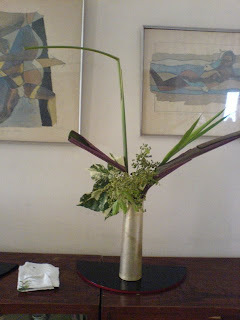 How about abstract ikebana? 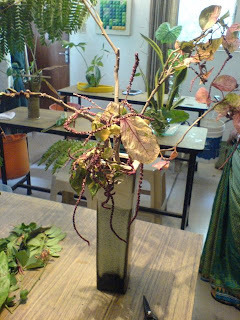 Apparently, abstract art can be configured with ikebana, as elucidated by this dry vine and orchid arrangement by Vaishali N. Vasa, Ikebana teacher and model maker. The modern-looking chocolate brown Indian ceramic vase with its three tiny holes was the starting point. “The vase seemed too small and I wanted to make a big ikebana with dry material. 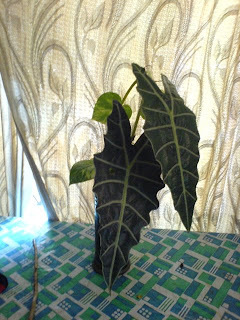 So, I decided to arrange the dry vine (called mitsumata in Japanese) in a triangular format”, explains Vaishali. The vines, which are four times lengthier than the vase, are kept tied by soft metal wire. The vines enclose space and enlarge the ikebana. The light blue colour of the vine and geometric shape lend a modern feel to the arrangement. Following this, Vaishali merely stuck orchid stalks in the vase, pouring in water to keep the orchids fresh. Well, this is a simple but effective arrangement. The advantage of dry vines is that they retain their colour and texture for years. The orchids stay fresh for about four days in our hot weather. So, you can retain this ikebana perpetually by simply changing the orchid stalks. Even traditional art forms can accommodate cultural confluences. In any case, art is never the exclusive prerogative of a culture. 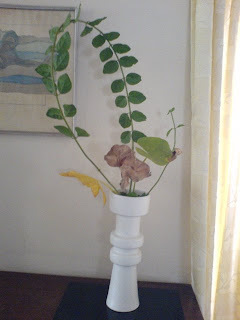 Elucidating this theory is this thoughtful ikebana arrangement by Sogetsu Ikebana teacher Malathi Pandurang. At first glance, the striking bamboo stalk that towers over the bunch of chrysanthemums set in an antiquarian brass urli celebrates the vividness of nature. “In ikebana, leaves and flowers go together. They complement each other and give an enriched look”, Ms. Malathi says. Explore further. The brass urli resonates with Indian ethos. While today, the urli has come to be used as a decorative piece, Indians had been storing water in it for centuries. 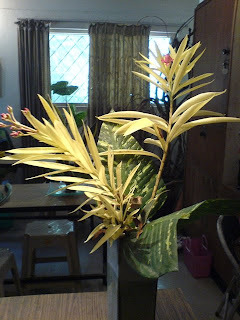 Malathi has filled the flat urli with water, and remember, water holds a lot of meaning in ikebana. Malathi has used a miniature garden bamboo here to represent the Japanese bamboo. The Japanese bamboo grows to spectacular heights, nourished by the rich volcanic soil in Japan, and is a wonderful specimen of Japanese flora. Perhaps, it is because of this that the bamboo remains a traditional and sacred material in ikebana. Chrysanthemum also happens to be Japan’s national flower. The accommodation of the bamboo stalk and chrysanthemum flowers in the brass urli spells out the fusion of Japanese and Indian ethos, set in the semantics of ikebana. At another level, the arrangement symbolises perfection in character. The commanding height of the bamboo stalk radiates a sense of strength, while the chrysanthemums reach out spreading an aura of grace and gentleness. Together, it does make for a winning combination. Tired of coming to the blog and finding nothing new? Well, you can use the "email alerts" option now. Just enter your email address in the space that you see on the right side of the page, and click "Subscribe". You will get an email from Feedblitz, asking you to verify that you actually want an update. If you verify the request, then you will get an email alerting you, whenever this blog is updated. Check out these lovely garden flowers! Workshop is workshop, wherever you are !! Ambika, now the blog really looks alive. Looks like I did indeed miss loads of fun!! 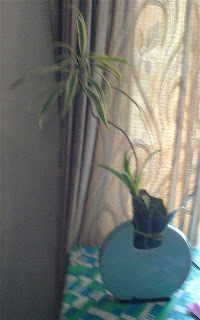 And man, havent you created some beautiful Ikebana!! But for that fire in that A/c of the bus, I should have been there !! Do we have a new member - Chainika?? Good to hear that. And where was Ashok ?Now, on to some serious work. What do you think I did all the while...???? After hours of serious thoughts, prayers, meditation and so on, I decided to post the picture of the arrangement I did at home while the workshop was on... Don't laugh. Honestly, I had to gather up all the courage I had and borrow some more, to post it before the Senseis :) I know you will excuse this 7 month old kid (only for Ikebana) and will write in your comments, opinions, comments etc etc. It would really help me learn, understand, correct, improve and grow. I had picked up some lotus leaves day before yesterday, to bring to the workshop. They were just getting dry and beautiful today. I would have used a black vase, if I had one. I wasnt left with any other choice, so I used this brown one. So thats it!! See, workshop is workshop. Wherever you are. Meet you in the next post !! Creative with leaves, and only leaves! The theme was all leaf arrangement, and all the ladies had come prepared with such beautiful and varied leaf material. I dont think any 2 of us used the same material! Unlike flowers, where we have a limited choice in Madras, our weather is so good for leaves of different colours, textures and sizes. Unfortunately, I had only my little phone cam, and so the pictures are not that great. And also, I just took the pictures as we created, so there's no eye for backdrop or light, so just enjoy! 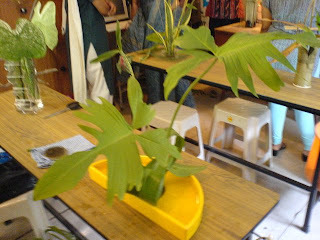 Chainika (I hope I have her name right) had a lovely combination of green and dry material, and the photo has chopped off the long lines in her moribana, while Seetha brought these interesting leaves - are they a kind of monstera? 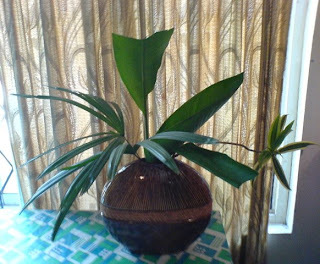 - with aspidistra leaves rolled up. Chitra used her favourite sans savera, while prerana experimented with the brown of the acalipha leaves and the green of the copper pod leaves. 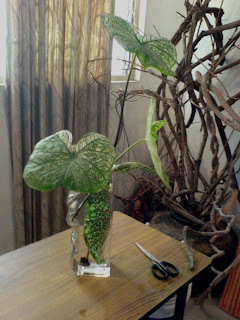 Vaishali very ingeniously curled a caladium leaf in the mouth of her container, and used variegated dressina tall. 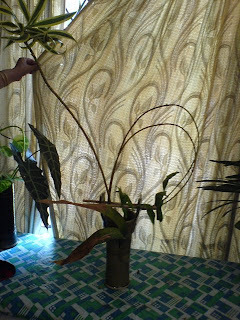 Trishala used palm and heliconis while Meenu worked with the money plant and these large caladium leaves. I used alamanda vine with dressina tall, and a dried aspidistra leaf low down. (The fingers you see are Trishala's!) Molly's new glass vase with and all-caladium leaf composition. The variegated oleander stalks (aren't they spectacular?) were brought by Prerana. From the cheerful confusion of the workshop room, we moved across into the living room. Dali's arrangement with berries, palm stalks(?) 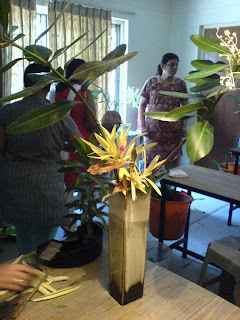 and Malathi's arrangement with a jasmine vine and leaves in various stages of dyness!! This ikebana arrangement maintains perfect rhythm with three natural elements – water, earth and the sky, says Hema Vijay. In tune with nature: Ikebana arrangement can still nurture natural beauty and provide pleasure. The fact that Sogetsu ikebana gives you freedom to use any kind of material gives a shot-in-the-arm for the creative process. This has made Padma Swaminathan to come up with an ikebana arrangement that comments on contemporary environmental concerns. Conceptually, this arrangement highlights the need to protect the environment by maintaining the right balance between three of the five panchabhuthas - water, earth and the sky. “I wanted to show the benefits of keeping our water bodies free of pollution, which would foster a favourable and symbiotic relationship between marine and plant life”, says Padma. Padma opted for a rectangular black ceramic vase from Korea. She placed oyster and coral shells (both from the Philippines) in the right corner of the vase (as accent pieces), and filled the vase with water to submerge three-fourth of the shell height. And inserted Japanese umbrella plants, and pink and white chrysanthemums in the hole of the coral shells to hold them in place, which also goes on to create a ‘tropical island’ setting. The Japanese umbrella stems have been trimmed and cut to different lengths to depict heaven, earth and man in accordance with the basic Ikebana principle. The mini-chrysanthemums were cut to different lengths as per the Ikebana principle that no two materials should be of the same length. “I chose mini pink and white chrysanthemums partly to blend with and partly to accent the colour of the coral and oyster shells”, Padma says. 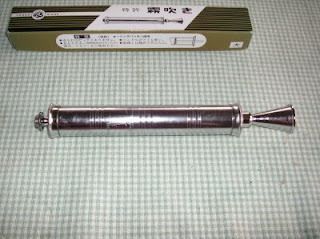 This is the piston / syringe that is used to pump liquid into stem of the lotus leaves. 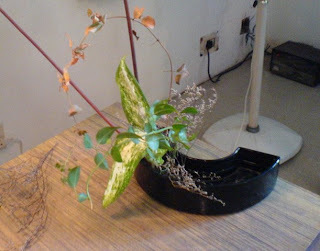 A friend of mine, from Japan, who is also an Ikebana Teacher of the Sogetsu School sent me this picture. She tells me that we can buy it through the Sogetsu School store. The Hindu : Property Plus Chennai : Even marsh weeds come handy! You can create great effect with the use of wild marsh weeds in a classic ikebana frame, writes Hema Vijay. Natural feel: A handful of marsh weeds set upright on a shallow ceramic vase. Need Ikebana be expensive and fanciful? Are those spectacular orchids and imported flowers a must? Not at all. You can use plant material you see around and create a great effect. Like Venkatesh Sthanusubramanian, who has brilliantly created a classy ikebana arrangement using marsh weeds growing wild in the countryside! “I keep travelling in the countryside and the bull rush weeds that inevitably grow near water bodies caught my attention”, says Venkatesh. That was the inspiration which culminated in this arrangement. Venkatesh caught hold of a handful of these weeds and set them upright (using an ikebana pin holder) on a shallow ceramic vase. A few stalks of tiny white star daisies and pink asters arranged casually at the base of the weeds complete the arrangement. The fact that Venkatesh chose to fill the shallow vase with water creates a natural lake effect. The arrangement augmented by the water body radiates an aura of peace and tranquility, while the tall and rising bull rush weeds give a sense of reaching out for the higher things in life. “I wanted to stick to a natural feel. That is why I opted for locally available, inexpensive, and subtle flowers like asters and star daisies. Fanciful flowers would look unnatural here”, Venkatesh elaborates. You can also use other kinds of weeds, flowers like the vadamalli, locally seen pebbles, and any sort of a shallow, broad container that allows for the water effect to be unleashed. Well, simple is beautiful! I love the Lotus and always wanted to do an Ikebana with it. I was thrilled to discover a lotus pond very near my home, on my way to work. My daughter and I now visit the pond frequently - sometimes to collect flowers and sometimes just to look at its beauty. 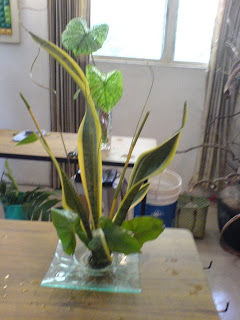 However, it was not a very joyful experience trying to make an Ikebana with the lotus and lillies. The lotus would immediately droop - the moment it is cut and taken out of water!! Those lilies from the pond are better - they stay upright for some time. However, I had to insert thin sticks like the rib of coconut leaf into the stem to keep them straight. Even then they last only for about a couple of days maximum. The Sogetsu Lesson says to inject liquid in which tobacco is soaked into the stem. I tried doing it with an ordinary syringe and ended up in a horrible mess - dejected and disappointed. Then I saw this picture of Iemoto Akane's arrangement in the Sogetsu Website. 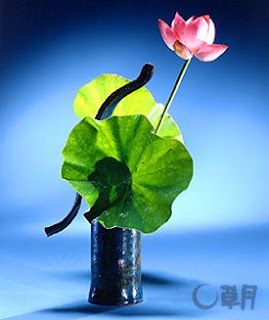 It was telling me that indeed, a beautiful Ikebana IS POSSIBLE with lotus. I then resolved NOT TO GIVE UP. To practice and practice, with patience, till I get my Lotus Ikebana right !! Please do wish me good luck :) Here is the Iemoto's arrangement for you! !